Our uniquely fresh extra virgin olive oil, which has won many international awards (Gold at 2014 Los Angeles International EVOO Competition, Gold at 2014 NY International Olive Oil Competition, Gold at 2014 TerraOlivo competition, Gold at 2014 OliveJapan, Gold at Prestige Gold at the 2013 TerraOlivo competition, Premier medal (Best of Show) at 2013 OliveJapan, and the Silver medal at the 2011, 2012 and 2013 Los Angeles International EVOO Competition), is harvested from ancient trees in Tuscany. The history of these olive groves translates into olive oil with a unique depth and richness of taste that is bottled at the peak of freshness. Our Balsamic vinegars are created by a collaboration between L'arte and a family run balsamic vinegar house which was started over 100 years ago. This Acetaia (vinegar maker) from Modena, the original birthplace of real balsamic vinegar, has a long tradition and generations of secret formulas which yield some truly amazing balsamics done with age-tested methods. Check out our new recipe section with delicious ideas for the L'arte products! Explore our store to see what we have to offer. 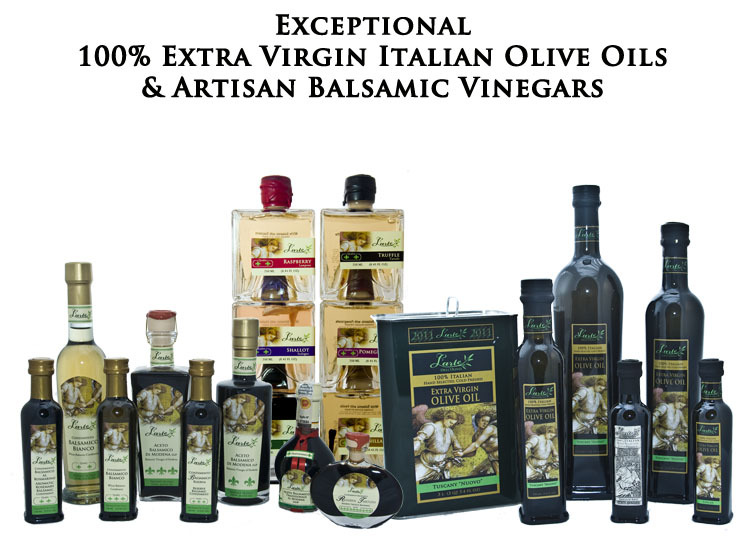 We guarantee that you won't be disappointed by our fresh & artisan gourmet olive oils and balsamics!